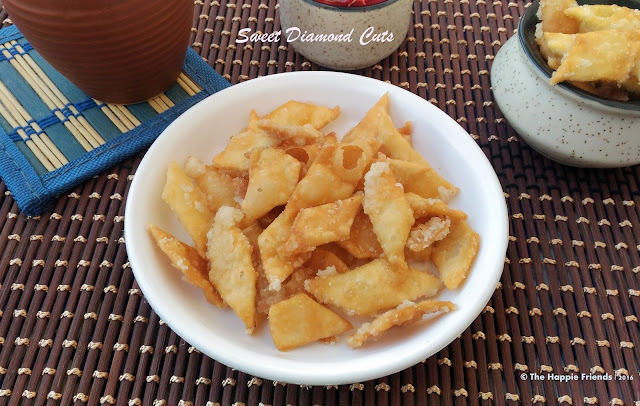 Sweet diamond cuts is an easy Diwali sweet .It can be made both as a sweet version or a spicy version. Today I am sharing the sweet version .The whole process can be finished in just half an hour. Now let’s get started. 1. 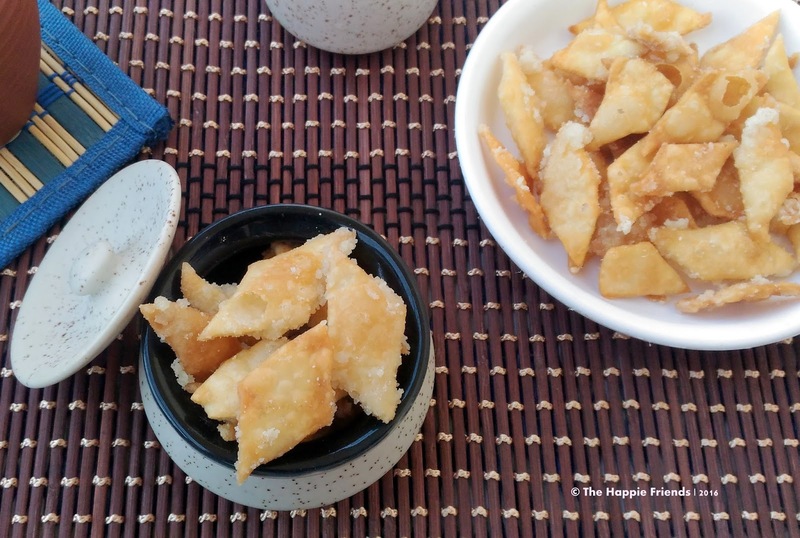 In a mixing bowl add in All-purpose flour ,Salt and oil/Ghee if using add water little by little and roll it into a soft dough .allow it to rest for 15 mins by covering it. 2. Take a small portion of the kneaded dough and with the help of a rolling pin roll the dough very thin as shown in the image. With the help of a pizza cutter or a sharp knife draw cross lines throughout the rolled dough ,with a spatula separate the individual pieces. Meanwhile heat oil in a pan for deep frying. 3. Drop the diamond cut pieces in hot oil and fry till it becomes golden brown in color and drain it in paper towels. 4. Now start preparing the sugar syrup by adding sugar and water continue cooking in medium flame till the sugar syrup becomes thick and switch off the flame. 5. Now toss the fried diamond cuts in the sugar syrup and allow it to rest for 10 mins. Once it completely absorb the sugar and it cools down store them in air tight containers. Instead of tossing the diamond cuts in sugar syrup you can also add powdered sugar and knead along with the flour. Don’t allow the sugar syrup to become too thick as the sugar starts crystallizing. Store in an air tight container for a longer shelf life. Yes Alboni.. 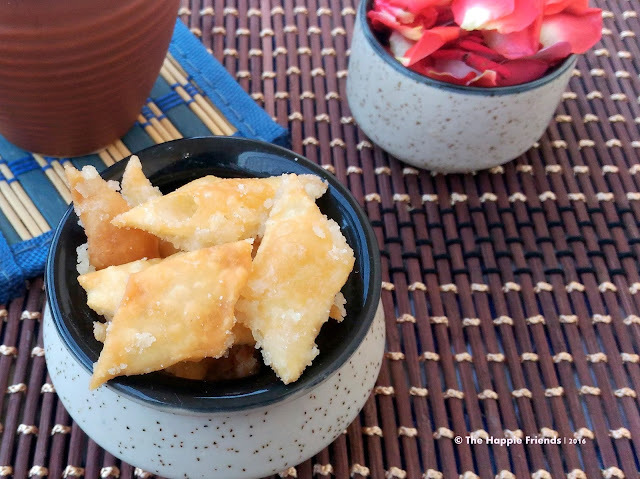 It is one of the easiest Diwali sweet which can be prepared in less time!! They look so golden brown and crisp! Looks so yummy and crunchy and love to have this crunchy snack....!! !